One of the top destinations for travelers all around the world, Kerala offers a huge array of natural riches, all of which are exclusively enchanting. Of these, the backwater holidays in Kerala perhaps are the most attractive among tourists. Sailing through the backwaters of Kerala will prove to be an utterly thrilling experience during your trip to mystical state of Kerala. Spice up your backwater holidays in Kerala by gliding through the green waters to be able to experience a magical charm of calmness and serenity amidst a chilly thrill. The backwater cruises in Kerala past bamboo thickets, palms fringes and bushes, coir makers' villages, bunch of water lilies, coconut palm groves, and traditional huts with their thatched roofs are some of the favorite tourist activities here. Extended for approximately 1900 km across the state, the backwaters of Kerala that once served as a trade route to the state have actually been formed by a huge network of waterways, lagoons, lakes, inlets from the sea, natural canals and estuaries of 41 west-flowing rivers, linking the main landmass to the remote villages, towns and islands. In order to experience some of the most exciting backwater holidays in Kerala you can opt to sail in the Valiyaparamba Backwaters, Alumkadavu, Chandragiri, Pathiramanal, Willingdon Island, Thiruvallam. The longest backwater stretch in Kerala is the Vembanad Lake, which meets the sea at the Kochi port and runs through three districts – Kottayam, Alappuzha, and Kochi. The Kuttanad area is another major option for sailing in the Kerala backwaters. A visit to Veli Aakulam lagoon will open up options for enjoying various adventurous water sports and exciting rides on the exciting speedboats. Boat races, and the houseboat cruises are the various options of activity in Kerala. Overall, backwater holidays in Karakoram, Kottayam, Alappuzha, Kochi, Periyar, Kumily, Thekkady, Mararikulam and Marari Beach are the common options for tourists visiting this state. Cruising through the Kerala backwaters get all the more exhilarating due to the houseboats or Kettuvalloms on which you have to travel. They are well equipped with living rooms, washrooms, kitchen, and a balcony. Here you can savor some of the freshly prepared traditional Keralite dishes. 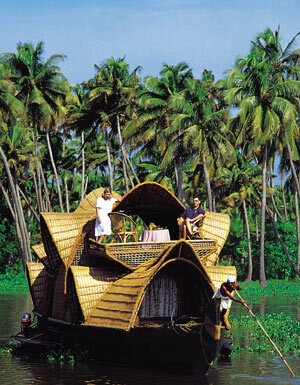 Log on to www.touristplacesinindia.com which gives online information on the backwater holidays in Kerala on your tour to India.